1. Sterilize canning jars or freezer containers. 2. Sort and wash fully ripe berries. Drain. 3. Remove caps and stem; crush berries. 4. Place prepared berries in a large mixing bowl. Add sugar, mix well, and let stand for 20 minutes, stirring occasionally. 5. Dissolve pectin in water and boil for 1 minute. Add pectin solution to berry-and-sugar mixture; stir for 2 minutes. 6. 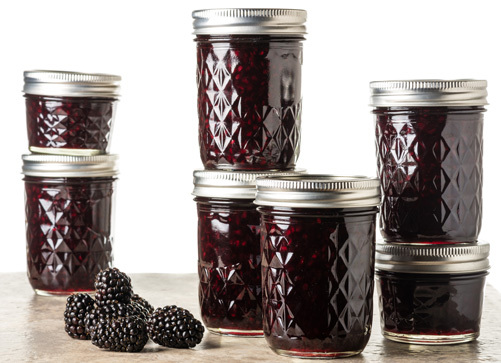 Pour jam into freezer containers or canning jars, leaving ½ inch headspace. 7. Close covers on containers and let stand at room temperature for 24 hours. To store: Store uncooked jams in refrigerator or freezer. They can be held up to 3 weeks in the refrigerator or up to a year in a freezer. Once a container is opened, jam should be stored in the refrigerator and used within a few days. If kept at room temperature they will mold or ferment in a short time.